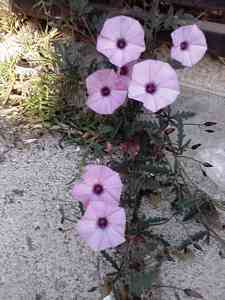 It is a species of morning glory known by the common name Mallow Bindweed. It is a plant with delicate, silver green leaves that will either climber or trail. 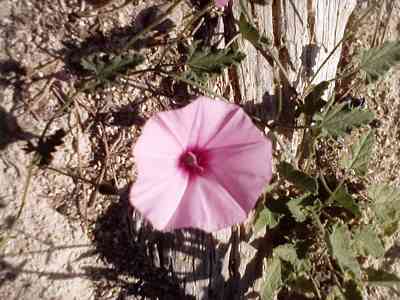 It blooms with large, funnel shaped, pink flowers from spring to late summer. It is beautiful in the garden, but can be invasive and is best grown in a container. 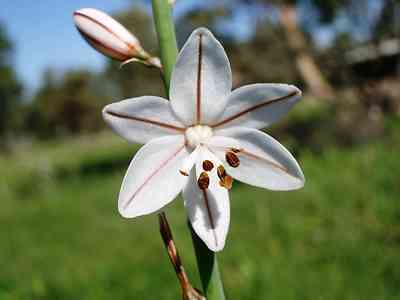 Asphodelus fistulosis, also called Onion Weed. Originating in Western Europe, this plant has escaped from gardens to become a troublesome weed in agriculture and is a declared weed in many parts of the world. It is all over the pinewoods, but weed or not – the star-shaped delicate flowers are exquisite. Oxalis pes-caprae is also known as Bermuda buttercup or Sour-grass. Bermuda buttercup is a low growing perennial broadleaf plant with shamrock-like leaves. Buttercup oxalis occurs in coastal dunes, scrub, gardens, turf, urban areas, orchards and agricultural fields. They are attractive, blooming with bright yellow flowers for many, many months, but are a nuisance when they spread into gardens or when they infest shrubs. 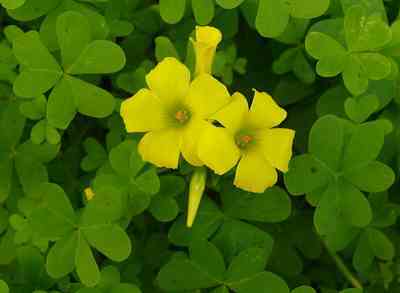 Although buttercup oxalis does not produce seeds, it is difficult to control because it propagates through underground bulbs. Pulling up the stems leaves the bulbs behind. Sometimes Bermuda buttercup is grown as an ornamental. Field Guide to the Wild Flowers of the Western Mediterranean. “Field Guide to the Wild Flowers of the Western Mediterranean is the most comprehensive and up-to-date plant identification guide to the area. The western Mediterranean is one of the most important regions in the world for its outstanding biodiversity, boasting over 10,000 plant species. The area encompasses southern Europe from the Portuguese Algarve in the west to Italy in the east, the islands (including the Balearic Islands, Corsica and Sardinia), and North Africa from Morocco in the west to Tunisia in the east. Carpobrotus acinaciformis with the common names Sally-my-handsome, Hottentot-fig or Sour-fig is a succulent perennial native to South Africa. It is particularly resistant to harsh coastal climatic conditions and to salt and is a robust and fast growing, creeping, mat-forming succulent that grow year round, with individual shoot segments growing more than 1 m per year. You find it all over the sand dunes and in the pine woods. 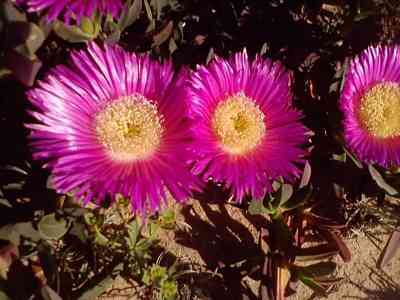 The large, pink flowers are very showy and the plant is frequently cultivated, especially in mild coastal climates. It is an easy-to-grow groundcover, ideal for low-maintenance and water-wise gardens. Flowering occurs mainly in spring and early summer. Echium sabulicola, also called Sand Viper’s-bugloss, is a creeping plant native to the sandy areas of the coasts of the Mediterranean region. It requires plenty of sun and prolonged dry periods. The plant blooms from early spring to summer, usually with blue to purple flowers, but can also be found with reddish/pink hues. 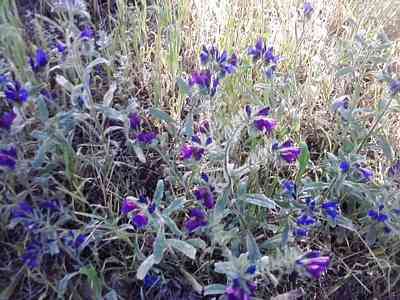 It lives in grassland and woods together with many other species considered weeds. 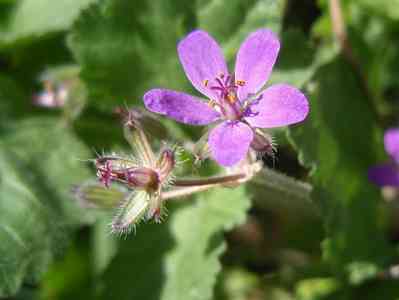 Erodium malacoides is a species of flowering plant in the geranium family known by the common names Mediterranean stork’s bill and Oval heron’s bill. This is a weedy annual or biennial herb which is native to much of Eurasia and North Africa, but can be found on most continents where it is an introduced species. It spreads very easily – the seeds often being carried in the fur of animals. I just love these tiny pink flowers. 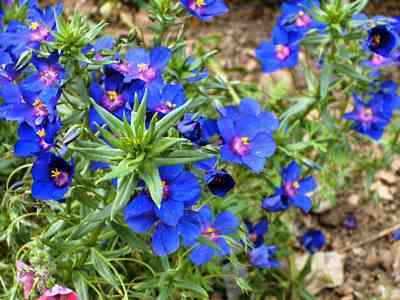 Anagallis monelli (Blue Pimpernel or Flaxleaf Pimpernel) is a species of pimpernel native to the Mediterranean region. It is a low-growing tender perennial of the primrose family with deep blue flowers and blooms from spring to late autumn. Helichrysum stoechas, also called Eternal Flower or Goldilocks. 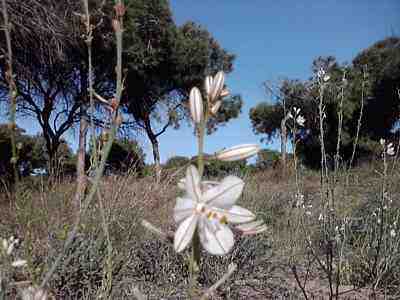 This is a plant of dry stony places mostly found in the eastern Mediterranean. 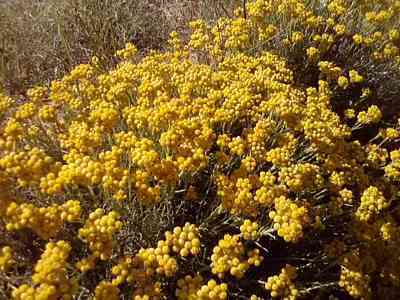 Many flowers of Helichrysum species look quite like this one – yellow and dry (everlasting) looking. This plant can be identified by a strong smell of curry when the leaves or stems are crushed. It flowers for several months. These plants all look great, but in the garden remember to control them as most of them are quite invasive. Unless of course, your goal is a natural garden full of wild flowers. There is an abundance of colourful wild flowers everywhere here in Spain – along the roads, in the campo, and of course in the woods.